Fr Hunwicke's Mutual Enrichment: WHO KNEW WHAT AND WHEN? Superb commentary Father, revealing clearly the moral sickness endemic among the Cardinals and Bishops of Holy Church. The swamp is in need of serious and efficient draining. A Catholic is sorely tempted to despair. While there are the beginnings of some critical comments on Mass Migration Francis in the oligarch press, very little of the latest Zanchetta revelations in El Tribuno (Argentine paper), or anything else reflecting badly on the world's Pope, will filter down to the ordinary time pressed worker. What does will just convince many that their lazy garden centre Sunday agnosticism is the best choice. What was once just boring, now becomes repellent. Thank you Fr for your wise comments. Prayer is all we have. Padre Pio, St Alphonsus Liguori, so many saints remind us to 'pray and don't worry' as that is useless. Tomorrow, 24th February, the Personal Ordinariate of the Chair of S. Peter, with great joy and thanksgiving, will celebrate its solemnity of title,transferred, of course, from 22nd February. The 'American Ordinariate' does not exist. 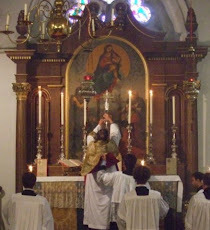 It is a North American Ordinariate. To abbreviate it thusly is akin to referring to the UK as 'England'. Cardinal Danneels was at Pope Francis' side on the balcony primarily because he was the senior cardinal-priest in the conclave; the senior cardinal-deacon announces the election and the senior cardinal-bishop appears as well. Cardinal Hummes, by contrast, was on the balcony solely by papal prerogative. Danneels' presence on the balcony, in itself, isn't proof of papal favor. His subsequent appointments to the family synods (despite the Vangheluwe scandal and his being over eighty years of age) and his ongoing influence bear ample witness to that favor, though. Conry's successor has told us to increase the money in the plate as part of the Diocesan plan. I wonder how much Conry cost the diocese and still costs us. I doubt if we will ever know. Incidentally evangelisation is being subcontracted to the Society of Jesus. I wonder if individual Jesuits will be scanned for heretical viruses before being let loose on us. You may be aware that Michael Voris released a video Friday morning in which he asserted (based on testimony from his Rome sources) that Mr. McCarrick was recruited into the priesthood during a visit to St. Gall--when he was 16 years old. And further, that his recruitment was part of the Stalinist effort (described by Bella Dodd) to infiltrate the Church's clerical ranks with Communists, St Gall being the locus of the Euro-American recruit/training operation. You also know--because the members have named themselves--that the St Gall bunch includes Daneels, Kasper, Martini (a patron of Rembert Weakland, OSB) and other Cardinal-level folks. Voris' revelation is in the "too good to be true" category, is it not? Or is it? Remember that Bugnini was tossed from Rome NOT because he was a Mason--but for something "far worse." For a cleric of whatever rank to be a Communist is just as horrid as for him to be a Freemason---both being variants of the same Luciferian rebellion against God and man. And, shockingly, even as we converse, the web page for the St. John (Calgary, Canada) parish of the North American Ordinariate of the Chair of St. Peter announces on its web page that funeral rites for known members of Freemasonry and other secret societies will not be denied---this despite over 14 magisterial condemnations of Freemasonry and its clear historical and active hostility to the Church and to the Catholic Faith and to traditional social mores. Does Bishop Lopes know and approve of this scandal? It would be very difficult to imagine he does not know when all it takes is a quick look at St. John's web page. Have the ordinariates a separate magisterium? If so, we have a right to know. Highly disappointing, to say the least, for those of us who both love the ordinariates and wish them every success. One way to look at the problem is to understand that the modern church is La Cosa Nostra (Our thing) actualised for the benefit and pleasure of the revolutionaries in control. It is revealing that the modern Church engages in its own brand of revolutionary anarcho-tyranny. It punishes the Traditionalists and fetes, favors, and elevates into the Hierarchy sodomites and heretics. It has quite clearly punished those who adhered to lawful Tradition (until it was outlawed by the lawless) and it forbade the pluperfect worship of God as the Saints, inspired by The Holy Ghost, formed the great Roman Rite. Not only do we not know the outcome of the +Arundel investigation - there is no clarity as to its terms of reference in the first place. Our magic circle in England and Wales is relatively benign as these things go, but it still has to realise that such opacity doesn't do it any favours these days. I trust that the newer members have the fibre to change this. I too hope that people can pull their heads out of the sand and see what is going on in the Church today. I am a bit frustrated however at some of positive words being directed towards certain prelates. For example, Bishop Lopes says that people knew about the abuse of seminarians from back when HE was in seminary. And? Did he say anything to anyone, or do anything about it? Did he write a confidential letter to anyone in authority in the Church who might investigate? I hope so, but is does not sound like it. What it sounds like, is that he and others waited until it was politically safe to say something. I cannot help but wonder how many seminarians were abused after that time. How much of the rot that McCarrick spread throughout the Church might have been avoided? Dear Fr. Hunwicke, are you able to help me please? I have found the prayer of St Peter Damian to the Blessed Virgin, different versions with slightly different wording, but ideally I would like to have the prayer in Latin so I can recite it throughout Lent. Do you know the prayer, or could you suggest where I might be able to find it? Yes @ABS, however in the case of the Church, we know that the present "Capo Bastone" is only in charge while the real "Capofamiglia" is away and at some unknown time will return and intervene much to the chagrin of those who have misused their positions.